Pictured to the Right: December of 2017 partial class photo; many are missing for the holidays. 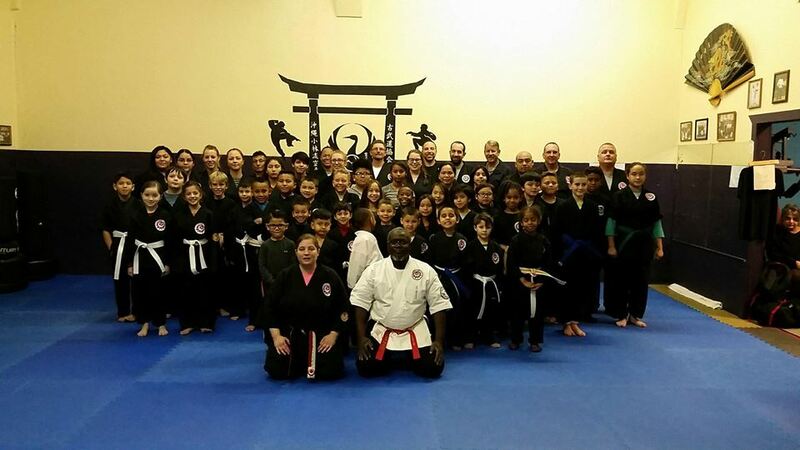 Rayford Shorin-Ryu Joins Karate for Christ International ! Download Rayford Shorin-Ryu Membership Applications! As a new student in martial arts, it is difficult to understand just how much Shorin-Ryu has to offer without having another style to compare it to. Many styles of karate offer the experience of learning katas (forms) without the student really understanding what the movements are all about. There are literally thousands upon thousands of individuals who achieve high ranks without the knowledge of how to use their art in a realistic manner. There are also several who win kata competitions at tournaments with great and sound looking techniques, but still no knowledge of the kata's content. Shorin-Ryu offers an education in bunkai (practical kata application), which allows the student to truly experience the art in the spirit for which it was originally intended; self-defense. Shorin-Ryu is one of Okinawa's two original styles of karate (the other one being Goju-Ryu), wherein the practitioners of these styles had no concept of their art being a "sport". Shuri (Shorin-Ryu) and Naha (Goju-Ryu) Okinawa were villages of oppressed people who had one thing in mind when they practiced their arts; survival. Home School Groups can also join us in our evening classes! Featured On This Site: This site will be featuring much more than just the Rayford Shorin-Ryu Karate & Kobudo Dojo. Our school is a member of the World Okinawan Shorin-Ryu Karate & Kobudo Association (WOSKKA). Kyoshi Rayford's late teacher, Hanshi Sid Campbell (10th Dan) and Hanshi Dan Tosh (10th Dan) began the association in May of 1996. Since the passing of Hanshi Sid Campbell in September of 2008, co-founder Hanshi Dan Tosh has become the association's President and Kyoshi Sid Rayford is now the Vice-President. Visitors to this website will also see pages that are dedicated to our association schools and their head instructors. Please keep an eye out for links to our associated school's websites. This website is dedicated to my beloved friend and teacher, Hanshi Sid Campbell. Hanshi Campbell is the pioneer of Kobayashi Shorin-Ryu Karate to the West (U.S) and has promoted over 800 Black Belts in his 40 year teaching career. He has given his heart along with the art and those of us who have been fortunate enough to train under him will benefit from doing so for the rest of our lives. Hanshi Campbell was diagnosed with cancer in lumbar 3 and lost the usage of his legs while enduring great pain back in early 2007. But this did not stop him from working. 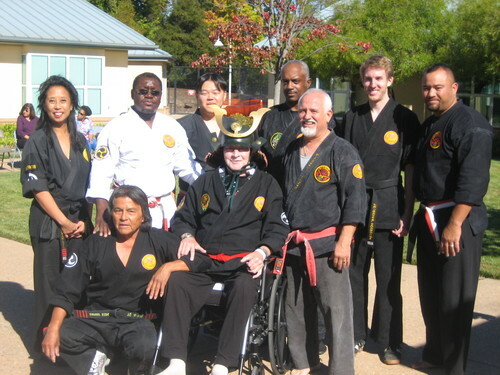 Even while recovering in the VA Hospital in Martinez, Ca., Hanshi Campbell conducted an exam (at the hospital) wherein he promoted Sid Rayford and Jerrell Smith to 7th Dan and gave them their Kyoshi titles. Hanshi Campbell, we dearly love you and may your recovery be a swift as your hands and feet have always been. Pictured on the Bottom: Group photo of examinees with Hanshi Dan Tosh and Kyoshi Sid Rayford on either side of Hanshi Campbell. Photo taken immediately following the exam at the VA Hospital in Martinez, Ca. on September 29th, 2007.